Just this week, a client shared with me a wonderful tip! For a mere $10, Pet Valu, a pet store located near our veterinary hospital in Ardmore, Pennsylvania, offers a do-it-yourself dog washing station. For those of us with big dogs (I have an 80-pounder and a 40-pounder), washing dogs at home can be difficult and horrifically messy. In the summer, I can easily wash Kona and Maeby outside on the deck, with the garden hose. When the weather turns cold, however, I’ve had to resort to shampooing them in my home’s only tub, which leaves me soaking wet, the walls dripping, and pet hair everywhere- a suboptimal situation! Last weekend, my husband, son and I took both dogs to Pet Valu for a bath and it was truly a wonderful experience. They have three tiled tubs, with stairs that dogs can easily climb. No more lifting 80 pounds of thrashing dog into the tub! Hand-held shower heads, oatmeal shampoo, plastic aprons to keep your clothes dry, plenty of fresh, clean towels and a mobile dryer station all made this a very pleasant experience. The facility was spotlessly clean, the staff friendly and helpful and the cost affordable. 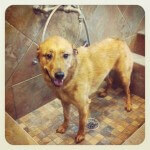 Plus, after 6 baths, Fido gets one free! 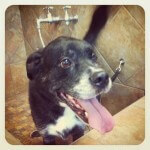 My bath tub and my back thank you, Pet Valu!